Want to go to the SCBWI Mid-Winter Conference but you just can’t make it? Well, have no fear. 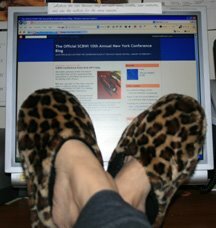 Thanks to the wonders of internet technology you can keep abreast of all the action without ever having to leave your fuzzy slippers. The SCBWI is on Twitter and will posted regular updates on conference happenings. Just click here to see it! Alice Pope, editor of the Children’s Writers and Illustrator’s Market Guide, will be blogging live on the The Official SCBWI 10th Annual New York Conference Blog. Alice will be posting on Twitter too. Just click here! How cool is this for folks who can’t make the trek to NYC this year! Happy conference surfing!